Diabetes is the leading cause of neuropathy in developed countries, and neuropathy is the most common complication and greatest source of morbidity and mortality in diabetes patients. It is estimated that the prevalence of neuropathy in diabetes patients is approximately 20%. Diabetic neuropathy is implicated in 50-75% of nontraumatic amputations. Uncontrolled diabetes leads to lots of complications in diabetic neuropathy patients. Diabetic neuropathies are a family of nerve disorders caused by diabetes. People with diabetes can, over time, develop nerve damage throughout the body. Some people with nerve damage have no symptoms. About 60 to 70 percent of people with diabetes have some form of neuropathy. People with diabetes can develop nerve problems at any time, but risk rises with age and longer duration of diabetes. Our ranges of Neuropathy Products helps to quantitate the diabetic neuropathy. All these Diabetic Neuropathy Products are thoroughly tested by team of talented professionals, thus ensuring 100% precise result. Today, we have carved a niche as one of the major Neuropathy Care Products Exporters from India. Vibrotest Digital Biothesiometer has been shown to be strongly associated with foot ulceration. VPT determination by using a Digital Biothesiometer has been used to identify peripheral sensory neuropathy and subjects at risk of foot. Digital Biothesiometer helps us quantitate the threshold and monitor progressive changes or trends on following up testing. Early detection of vibration perception threshold (VPT) helps better prevention. Prevention is better than no cure. 50% of all non-traumatic amputations occur in diabetes who is a high risk group. Packaging Details: As per the customer requirement. 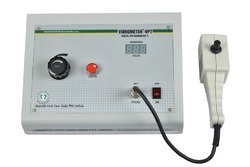 Vibrometer Digital Biothesiometer has been shown to be strongly associated with foot ulceration. VPT determination by using a Digital Biothesiometer has been used to identify peripheral sensory neuropathy and subjects at risk of foot. Digital Biothesiometer helps us quantitate the threshold and monitor progressive changes or trends on following up testing. Polyneuro Digital Biothesiometer VPT Diabetic Neuropathy Polyneuro Digital Biothesiometer is an electronic tuning fork that helps the physician to detect the loss of vibration perception threshold. Proven technology developed 25 years back and validated by many scientific papers both in India and overseas. First Digital model with Computer connectivity from India and introduced as early as 2004. This model helps the user to connect with or without computer. When connected to computer software helps the user to connect the Polyneuro+ to the Computer using wither through USB(wired) or Bluetooth(wirefree / Wireless). Software supports Any Windows (Xp, 7, 8, 10) operated computer. The Best Android Software helps to connect the Polyneuro+, Digital Biothesiometer though Bluetooth and any Android compatible Mobile or Tab and the reports that is generated as pdf may be shared by WhatsApp, email or any other service. The Vibrodop Digital Biothesiometer With Vascular Doppler For ABI is a measure of the severity of atherosclerosis in the legs but is also an independent indicator of the risk of subsequent atherothrombotic events elsewhere in the vascular system. The ABI may be used as a risk marker both in the general population free of clinical CVD and in patients with established CVD. 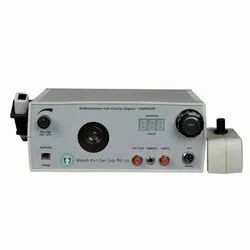 Looking for Biothesiometer Equipment ?